Acupuncture is an ancient Chinese system for moving energy, or Qi (pronounced chee), in the body in order to improve health. Energy flows in specific pathways in the body, and when it is blocked or stagnant, disease results. Acupuncture is the insertion of fine needles, about as thick as a strand of hair, into specific points to help control the flow of energy. This is done both as preventative medicine and as treatment for injury or illness. A diagnosis is arrived at by examining the patient, including a full traditional examination, then an Eastern medicine examination including tongue color, pulses, and reaction to pressure on acupuncture points. Other elements may be considered, such as lifestyle and personality traits. Once a diagnosis is reached, a prescription for acupuncture can be made. Most commonly, needles are placed in specific points and left for 15-30 minutes. This is called dry needling. Sometimes an electroacupuncture unit might be connected to these needles, with a low current to increase the stimulation at these points. Moxibustion may also be performed, the burning of dried mugwort at specific points. On occasion, B12 (a liquid vitamin) may be injected at these points for prolonged stimulation. This is called aquapuncture. Every patient is different, and different techniques may be used at different times depending on the developing needs of the patient. In addition to acupuncture, there may be some herbal supplements recommended that may assist in treating the patient. Other recommendations may be made as well, including diet and lifestyle changes. As the patient responds to treatment, both their acupuncture prescription and any other recommendations may change. Acupuncture is typically painless, although there may be some tingling or irritation as the needle passes through the skin. 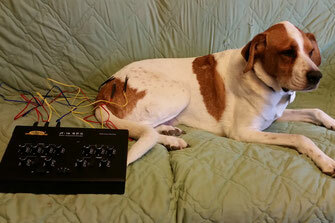 Once the needles are in place most animals become very relaxed. Acupuncture is generally safe, but some side effects can occur. Commonly animals are sleepy for about a day after treatment. Sometimes an animal may seem worse up to 48 hours after treatment, as the energy moves. After this the animal generally shows some improvement. 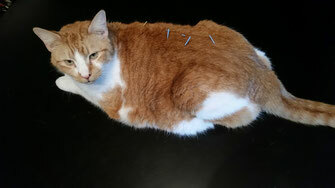 There is a small number of animals that do not show significant response to acupuncture, either due to medication they are already on or due to their physiology. Often animals need a course of treatment for best results, although this will be determined based on progress after treatment. There are some conditions for which acupuncture is not recommended. In these cases other treatments such as herbal supplements may help.